Having reviewed a software oriented drawing program in the last issue of the magazine (PAINTBOX from Print ’n’ Plotter), it seemed irresistible to take a closer look at one of those trendy light pens which supposedly turn your TV screen into a versatile drawing board. The Trojan light pen comes neatly packaged in an ex-VHS plastic cassette box containing the magic wand, which could easily be mistaken for one of those promotional biros (it evens includes address and telephone number) if it weren’t for the protruding cable terminating into a battery clip connector and plug, a 9V PP3 battery, the utility program cassette and the instruction leaflet. The program is loaded in the usual way and prompts you after autorunning. The cassette recorder plug (EAR) is removed from the Spectrum and swapped with the light pen plug. The battery connector is clipped onto the PP3 battery. The fun may begin. Its second use is as a high resolution drawing pen. After selecting HIRES DRAW you are confronted with a simple pen alignment routine which gives way to a menu line display. To select a function you just line up the pen with the letter or the blank space on the right hand side and press key 1. A white cursor will travel to the point selected and the option is selected. M Move the main cursor. 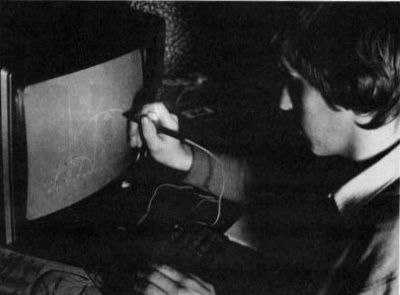 Once selected the program prompts you to position the pen in the desired position and to press 1. S Secondary cursor for line, box and circle routines. B Box with M and S as opposing corners. CO Copy screen to printer. C Circle with centre point M and radius ABS (M-S). D Draw. After selection position pen at desired starting point and press 1. A flashing cursor controls your writing speed: Do not move pen outside flashing cursor area or the line draw facility will not be able to follow the pen movement. CR Print characters with M as starting point. F Fill Area designated by M. Upon selection a colour menu will appear on the screen. L Draws line from M to S.
N New clears the screen to the current paper colour. T Saving or loading screen content. The light pen performed satisfactorily with all functions, but it was found to be very sensitive to the light conditions: The TV brightness had to be adjusted for optimum results and the TV set not exposed to any glaring sunlight. The draw facility suffers from its usual setback with light pens of not being able to locate the writing position accurately enough for high resolution drawings and the drawing of straight lines in this mode requires a lot of practice and skill. Paper colour selection allows for instant colour switching, but also creates the usual confounding problem caused by the character mapped attribute resolution. Ink and paper colour will clash if not worked out within the confines of the attribute boundaries. The colour fill facility displayed the usual speed, but appeared never to crash even if the area to be filled wasn’t ‘airtight’: the routine would escape from the leak and fill the entire surrounding area and give a triumphant bleep of approval upon completion much to the dismay of the screen designer. Using erase however clears up this mess and gives you a second chance. Obviously the light pen has its limitations for freehand drawing due to the inaccuracy of positioning the pen on a pixel level, but then no one should expect to be able to draw to such a high resolution on the curved TV screen at an uncomfortable angle and with possible alignment errors. It is left to the individual to accept this limitation or to forfeit the freehand drawing for a cursor controlled drawing routine. Certainly the menu selection facility is very elegant and can obviously be incorporated into one’s own programs. For the ultimate professional screen creations it is still necessary to revert to the primitive paper grid pad design where the original artwork has to be simplified and coaxed into the confines of the pixel and attributes grid of the Spectrum and input via binary or decimal code direct into the screen memory area. The light pen certainly is a lot more fun to handle and should at least convert your TV screen into an amusing and versatile sketchpad.